Inala Country Accommodation, Bruny Island. Inala and Nairana Cottages provide exclusive accommodation at Inala. Guests staying in the well-appointed, cosy cottages are welcome to wander through our 5 acre Jurassic Garden, visit our Nature Museum, go birding or explore the walking tracks within the different habitats on Inala’s 1,500 acre (625ha) private nature reserve. A map of the reserve and a bird list are provided for guests in each cottage. Several hides have been constructed in key viewing areas including a raptor hide and an elevated viewing platform for Forty-spotted Pardalotes. Over 500 species and subspecies of well-labelled plants have been thoughtfully planted in family groups in the Jurassic Garden, making it easy to compare and contrast how these living remnants of the ancient supercontinent Gondwana have survived across a diverse array of environmental conditions after the continents drifted apart. Inala Cottage: This 4 star standard, 3-bedroom/2 bathroom cottage is set in idyllic surroundings next to a tree-lined stream in forest/pasture surrounds with views of the South Bruny Ranges and tall eucalypt forest. It overlooks the Jurassic garden and has its own private garden comprised predominantly of Australian native plants. Your nearest neighbours are the Forty-spotted pardalotes! Nairana Cottage is a one bedroom spa unit. 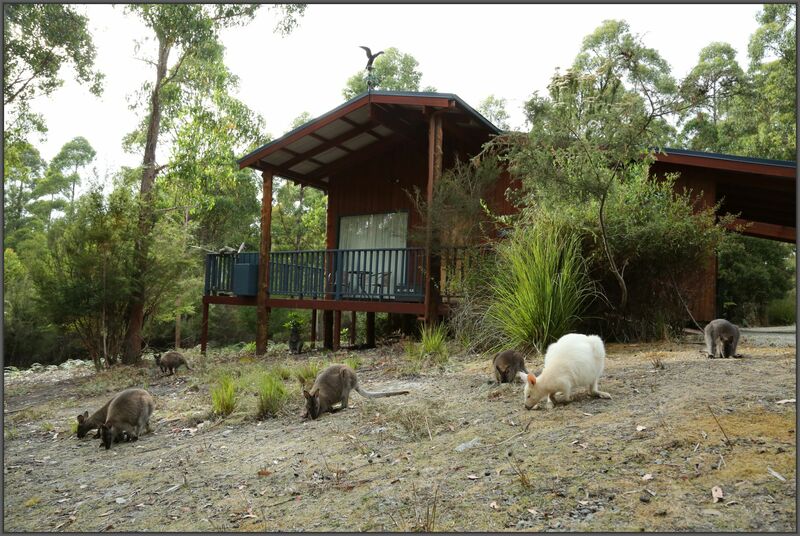 This 4.5-5 star standard cottage features high quality furnishings and Tasmanian timbers and has been purpose-built to maximize bird and wildlife watching opportunities within the forest. Wildlife is literally at your door and the cottage makes a great bird-hide! Sit on the veranda with a cuppa or glass of wine and watch the endemic Tasmanian birds pass by.